Look and Cook Cookbook Winner and Everyday with Racahel Ray Giveaway! Congrats Liz! Please contact me at kitchen_concoctions at hotmail dot com with your mailing address (if I do not have the winner’s mailing information with in 72 hours another winner will be selected). 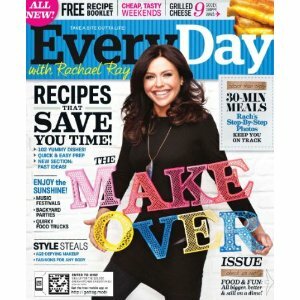 A YEAR’S SUBSCRIPTION TO THE EVERYDAY WITH RACHAEL RAY MAGAZINE! I thought that since I am doing a year of magazine reviews and this month’s is Everyday with Rachael Ray that this would be the perfect final giveaway. 1. Leave a comment on this post answering the following question: What is your favorite food magazine (or magazine with recipes)? I need a few ideas for future months! This give-away closes Saturday, July 2, 2011 at 12:01 A.M. CST. Winner will be chosen at random and will be announced sometime shortly after the give-away ends. Giveaway for US residents only. Disclaimer: This giveaway is NOT sponsored by Rachael Ray. I just like her magazine and recipes and like you my readers and wanted to host a giveaway! If Ms. Ray ever wanted me to come cook with her I would be happy to! Wink! Wink! I love food and wine! I don't have a favorite food magazine. Sorry we aren't much help! Follower through Google Friend Connect! My favorite food magazine is Cook's Country. I like Kitchen Concoctions on Google Friend Connect. You know, I can't really say that I have a favorite food magazine. I like KC on FB.